With the 2018 Worlds just ten weeks in our wake I could not help having that ‘Déjà Vu’ feeling and a strong one at that. In my first communication to the Nationals organizing committee in November I floated the term, ‘once more dear friends!’ To say we were all suffering burnout is an understatement but to their credit they all worked their bums off again to make it happen on the 13th January. Most of the procedures and organization to run the Worlds were still fresh in the minds of the organizing committee and with RQYS on and off water club management so it was nowhere near as arduous as for the previous regattas but nevertheless a high profile regatta so we had to bring our A game. There was always going to be a struggle to attract significant numbers to this regatta no matter where it was held with the Worlds being so recent and skippers and crews probably fresh out of vacation time with Worlds, Xmas etc. I guessed at 30 + for the regatta, the reality was 27 boats. This sounds a little disappointing until you actually look at the entries. 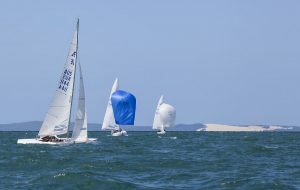 With no fewer than five past and current World Champions and two past and present Australian Champions an Olympic Gold medallist, a plethora of A grade professional and amateur sailors this was one hell of a hot fleet. Graeme Taylor (GT) the current Australian Champion had turned up to have a crack at winning his fourth on the trot, something which hadn’t been done before. John Bertrand had won three in a row and in fact has won the title seven times in total. The current World Champion Martin Hill in ‘Lisa Rose’ had also turned up to prove he had our east of Green Island course sussed with his win in October. 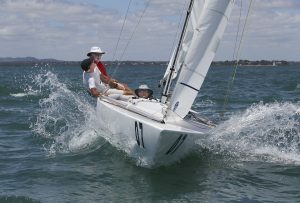 Our local legend Matt Chew was definitely going to be in the mix, but only after he had lost six kilos in two days having beefed up for the Australian Foiling Moth Championships the week before. Matt finished up a creditable fourth out of a field of 38 in the Moths, not too shabby. Matt was now backing up in the Etchells Nationals after an awesome third in the Worlds in October. I often wonder what he does in his spare time. 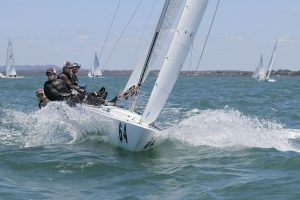 This was also the first regatta for a new boat to the Brisbane Fleet ‘Happy Hour’ sailed and owned by Becky and Dan Maloney with Drew Carruthers and crewed by Mark Matthews. 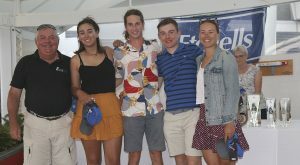 Similarly the first Brisbane Etchells youth team ever ‘Tumba Rumba’ was sailed by Simone Wood, Thomas Quigley, Adam Lavis and Samantha Costin. Well done guys, great to see. The predictions early were for a down range variable wind regatta with potentially sick Easterly influence. This doesn’t look good! This was going to mean tow boats again and thanks to the efforts of Peter White the services of Sam Allen in ‘Hard Slog’ and Keith Anderson in ‘Snowgoose’ both backing up having carried out similar roles in the Worlds, we were able to get the bulk of the fleet to the course, thanks you very much gentlemen. The winds for the week were light to moderate and with 1100 start times scheduled for the regatta there was a little bobbing around on the curse waiting for the breeze to fill in and settle, an AP ashore on one day and a rescheduling to 1200 on another. Generally the breeze came in 2 – 5 knots more than predicted on each day. The end result was champagne Etchells sailing with sunny skies …. ‘beautiful one day …….’. The serious business of the competition and the quality it attracted soon became evident with close racing all the way. Three of the first six finishers suffered UFD’s in their results. Iain Murray in ‘Havoc’ was in the front of the results each day however on the last day with one race to sail Matt Chew in ‘Gen XY’ had a lead of five points over Murray. Regrettably Chewie had a UFD in the last start effectively costing him the regatta. At the presentation Chewie remarked to the audience ‘I’ll win something one day’, no doubt about that Matt. 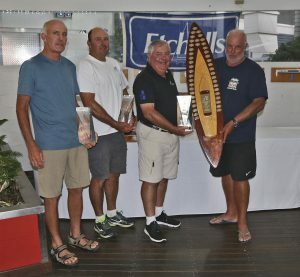 Overall podium results Australian Etchells Championship ……..
1st Place – ‘Havoc’ – Iain Murray, Colin Beashel, Richard Allanson. 3rd Place – ‘Lisa Rose’- Martin Hill, Julian Plante. Mat Belcher, Sean O’Rourke. 1st Place – ‘Animal House’ – Dirk Van Der Struyf, Ben O’Brian, James Hannah. 2nd Place – ‘Just Too Funny’ – James Hodgson, Trevor Martin, Stuart Kennedy. 3rd Place – ‘Land Rat’ – John Warlow, Todd Anderson, Will Thomson. 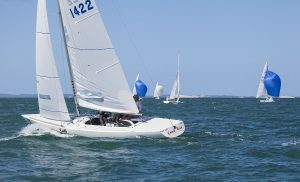 My thanks to the 2018/19 Etchells Nationals Steering Committee, the ever present David Healey, Mr IT – Jason Hawkins, the irrepressible Jenny Cooper, our new rock Laurie Wood and the Towie – Peter White. My thanks again to all of those RQYS and Etchells Volunteers involved in this regatta. It is hard not to speak in superlatives with regard to these people and it is a reality that without them we would simply not be able to conduct our sport of sailing. It has been a long hard road over the last several years running many regattas in the build up to these recent events. On behalf of the Brisbane Etchells Fleet, my sincere thanks to all those involved. 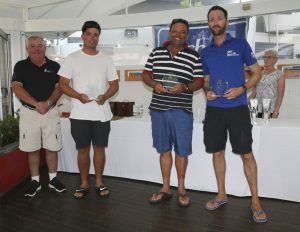 Etchells Australian Champions – Ian Murray, Colin Beashel, Richie Allanson.